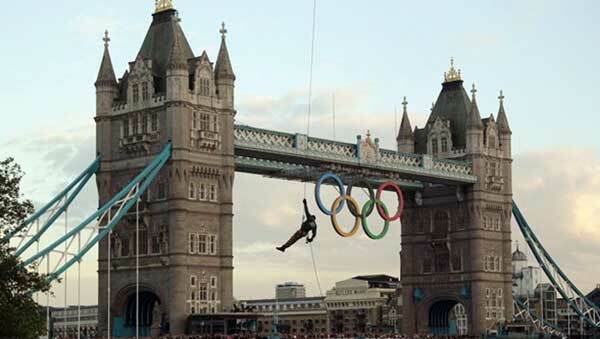 Adobe lends a hand to the BBC’s Olympics coverage. Have you heard about Adobe’s Project Primetime? It’s a unified video platform that delivers a TV-like viewing experience across platforms including smartphones, desktops, tablets and TVs. Aside from streaming video, it also handles digital rights management, ad serving, audience management, analytics and optimization technologies. Now the British Broadcasting Corporation has become one of Adobe’s first partners to use it to deliver live video streams and video-on-demand. Its debut is for the biggest show in town, that is, if you live in London. The BBC will use Adobe’s technology to stream Olympic coverage across the Web and all major types of devices and simultaneously stream them on desktops, smartphones tablets and internet connected TVs across the U.K. While it was announced in February at Mobile World Congress, I’ve only just heard of Project Primetime. It sounds very intriguing. What interests me is that Adobe, aside from delivering pre-production and post-production solutions, now wants the rest of the pie: delivery, broadcasting, and video-on-demand. They’ll even provide content creators a way to manage ad revenue. This makes sense. Adobe already creates tools to create video, why not offer ways to distribute it over multiple devices? I’m looking forward to hearing more about it. 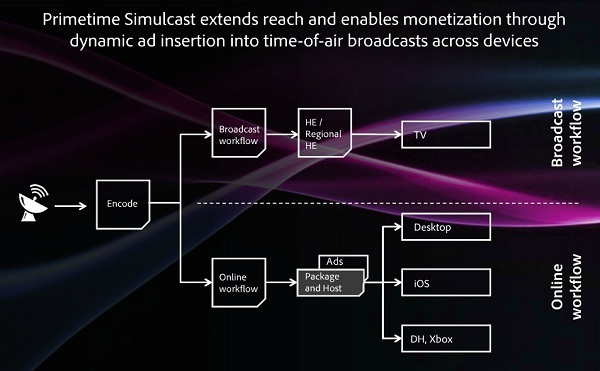 Primetime is currently in trial with major broadcasters and media companies around the world. Watch out NBC, Time Warner and the rest. 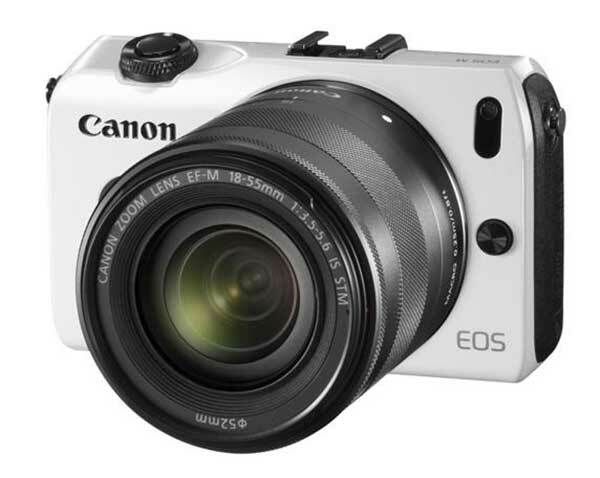 Canon’s EOS M is its first mirrorless camera. Addressing the growing market of full-featured mirrorless cameras, Canon recently introduced their own entry into mirrorless cameras with the EOS M, a compact camera that includes interchangeable lenses, DIGIC 5 processor and an APS-C CMOS sensor. If that starts sounding suspiciously like a DSLR, bloggers have pointed out that the EOS M draws most of its spec sheet directly from the just-released Canon Rebel T4i. I’ve been waiting to see what a Canon version of a mirrorless design would finally look like, considering folks have been speculating on what it would be for the last couple of years. So far, I like what I see. The EOS M joins other mirrorless offerings from Sony, Nikon, Olympus, Panasonic and Samsung. Canon of course offers up its own twists, including a new mount type, the EF-M. The best way to get an image from the lens to the sensor is directly without anything in between that could conceivably add imperfections or degrade the quality of the image. What need is there for mirrors in the first place? Why have mirrors in cameras at all? To me it seems more like a carry-over from film-based cameras. Considering that this is the first of Canon’s mirrorless designs, you can imagine that it points the way towards the future of its whole line-up. The EOS M offers 18 Megapixels resolution, and shoots 1080 video at 30p and 24p. You have to drop down to 720, however, to shoot at 60p. Like the T4i, it’s also got a hi-res 3-inch touch screen. ISO runs up to an impressive 25600. According to Canon, the camera, which they have described as an “ideal movie making tool” offers significant advancements in professional quality HD video capture from its advanced CMOS technology, smooth continuous autofocus, shallow depth of field, very good low-light image quality and wide dynamic range. Andrew Reid on EOSHD, however, criticizes the camera for codec and moire issues he claims the T4i suffers from. There are also two new lenses designed for the new camera format, the EF-M 22mm f/2 STM kit lens, a prime, and the optional EF-M 18-55mm f/3.5-5.6 IS STM zoom lens. You can also use the full line of Canon EF and EF-S lenses through the optional Mount Adapter EF-EOS M.
For those looking for a small form factor that takes professional quality video as well as great stills, this camera looks like a nice little package. I have heard some rumblings about the price, however. The EOS M bundled with a new EF-M 22mm f/2 STM kit lens will cost around $799 when it comes out in October. For what it offers, it sounds pretty reasonable to me. Manhattan Edit Workshop is building up its infrastructure with new appointments. New York City’s own MEWshop offers training on Adobe, Apple and Avid platforms, as well as DaVinci Resolve, Autodesk Smoke and Assimilate Scratch. Also notable is their two-week “Filmmakers Intensive” course. They’ve now revamped their facility with new roles in their organization: Jason Banke has been named Vice President of Operations and Janet Dalton is now the Director of Education. You know the terms already: cloud storage and cloud computing. It’s pretty simple in some senses. Web storage is common with services like iCloud or Dropbox. If the term Amazon Web Services (AWS) doesn’t roll off the tongue, it’s enough to know that players like Google, Microsoft and IBM each have web services targeted at challenging that industry leader of on-tap computing. Joe has already mentioned Adobe’s Project Primetime. It’s not a straight cloud computing or storage play. But there’s not much argument that Adobe plans to use the strengths of the Internet along with scads of compute power for its push into markets formerly controlled by the cable and broadcast networks. This year alone, Adobe will expand Project Primetime to cover workflows, devices and Simulcast. If it works as promised, a show could be broadcast on TV and online at pretty much the same time; each could be customized for the format as well as the intended viewers. Adobe’s “integrated video technology platform” will also garner competition from other companies who want to use the ‘net to deliver video to consumers, such as telcos. Verizon Communications and Coinstar (owners of the familiar Redbox DVD rental machines) recently began testing a streaming-video project that is expected to launch later this year. Dubbed Redbox Instant, subscribers to the service will be able to stream content to a variety of their devices. Relatively settled arrangements among broadcasters and cable companies continue to be contentious. But both face more immediate challenges from Internet based content providers, including Netflix and Hulu; these non-traditional distributors are challenging those established companies’ basic business models. Nor will friends in high places necessarily continue to condone the ways things have been done until now. Congress once forged the compromise between networks and cable companies. But even though the NAB continues to shower Washington with money, video on the net continues to ramp up quickly, and that just might change everything. One example: Senator Jim DeMint and Representative Steve Scalise recently introduced the “Next Generation Television Marketplace Act”. The bill seeks to repeal compulsory copyright licenses, various mandates on private sector companies and consumers, and FCC broadcast and media ownership rules. In an interview on the blog “Lost Remote”, writer Natan Edelsburg delves into one more innovative move that looks to knock over a dependable cash cow. If that potential loss of advertising income interests you, read the full interview with a Dish executive here. Here’s reality rearing its head, however: For producers, a derth of high-speed links to pump data to the ‘net mated with pokey network speeds for surfers still holds back a totally viable realtime Internet. Tell Congress that a high-speed nationwide Internet will help business and competition, something Eisenhower knew well enough when he helped push through the nation’s interstate backbone. That aside, let’s take a further step into the future, which actually means we need to think of the changes coming to an earlier stage of production, including editing and mixing. Most of the blueprints offered up by hopeful vendors propose that we will be working collaboratively with producers, directors, editors and others located in various spots around the county or even the globe. This of course can’t get around the fact that the majority of video production and post is still made locally, even if that group shifts around the country or world on a production. However, working collboratively is far from the standard, accepted way to create a production, remember that distributing video over the web itself once seemed of little value. You can already edit and transmit your videos via a smartphone or iPad, so it’s not surprising that a number of websites feature the ability for users to customize videos online. Open source technology platforms have been among the first to offer editing. One of the most robust and long lived is Kaltura, which offers everything from online timeline-based editing to commerical hosting and a CDN on its profit making side. Creaza’s MovieEditor is used by school children around the world. MovieMasher and OneTruMedia offer a more simplified approach for a wider audience. 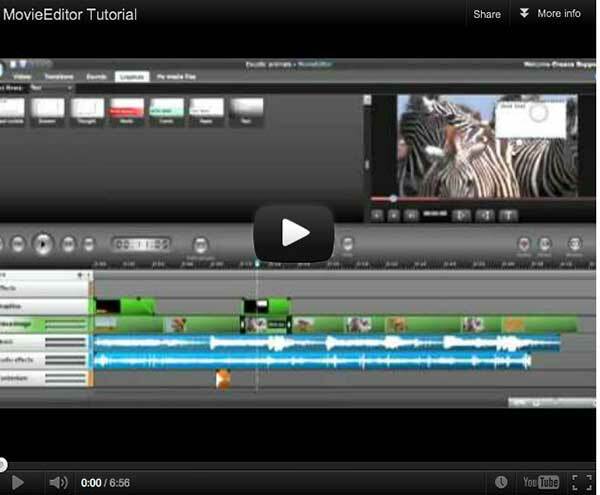 Creaza’s MovieEditor is used by an international melange of schools and other educational groups. A growing number of other sites also offer editing of uploaded video, including Vimeo and YouTube. None of these are very sophisticated yet, but remember, we’re still in the early stages of this. Some much more sophisticated efforts have begun in some parts of the production world. We’ve written about SoundStreak, which offers an online voice-over service. Market7 offers production coordination so that you can “assemble teams, define projects, develop content, securely share files, and communicate clearly”. 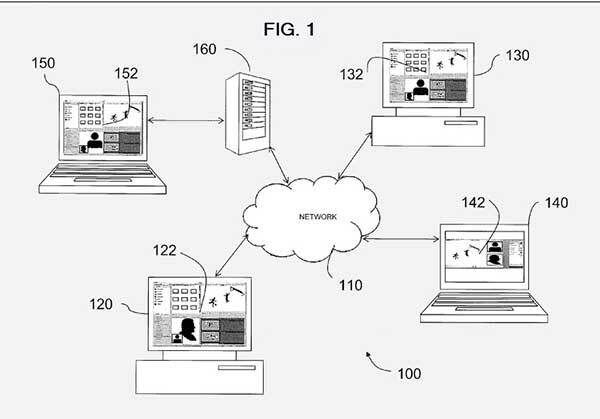 Apple won a patent for its online collaborative editing plans. Don’t think all of this editing-in-the-sky is just pie-in-the-sky thinking of what’s possible today. Apple recently won a patent for collaboratively editing video online. The original patent was filed in 2008. Maybe this is what Final Cut X is destined for.